This popular Bengali dessert is usually made during the winters but it is also prepared during the festivals. This Durga Puja you can prepare this delicious pitha item to entertain your guests. 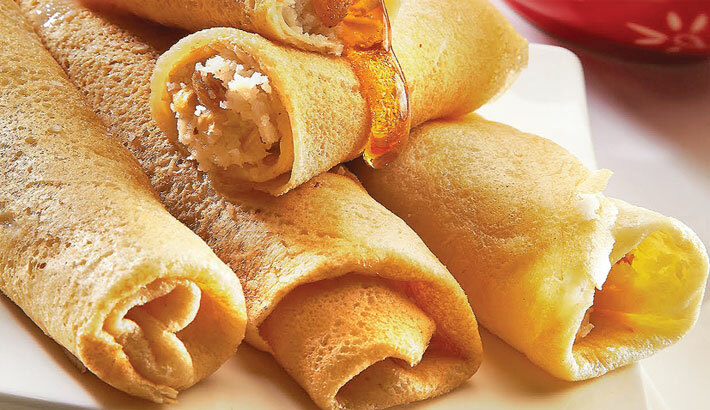 It is easy to prepare and is made with thin refined flour, rice flour and semolina crepes filled with coconut and jaggery. • In a bowl, mix the grated coconut with jaggery. • Heat a kadhai (korai) and sauté the mixture on a low flame. Then, add in the cardamoms. • Keep stirring the mixture till it has become sticky. It will take 20 minutes or so for this to happen. Keep aside and let it cool on its own. • Meanwhile, in a bowl, mix the rice powder and flour with a pinch of salt and water. Mix carefully till all lumps have dissolved. • Heat a non-stick frying pan. Sprinkle some oil on it and spread out the flour mixture in wide spirals to make a full circle. Allow the mixture to fry and swell up a bit. • Place the freshly-prepared Patishapta Pitha filling at the centre of the circle and roll it up. Keep frying till its colour has changed to light brown. • Repeat with the remaining mixture. Serve hot.